This first week of December is crazy for my family. Birthdays, multiple appointments, and nightly rehearsals just to name a few. Super easy weeknight chicken sausage dinner to the rescue! If you are looking for an easy weeknight meal to feed your family, give this one a try! I’m not a big fan of sausage, but the boys in this house love it. 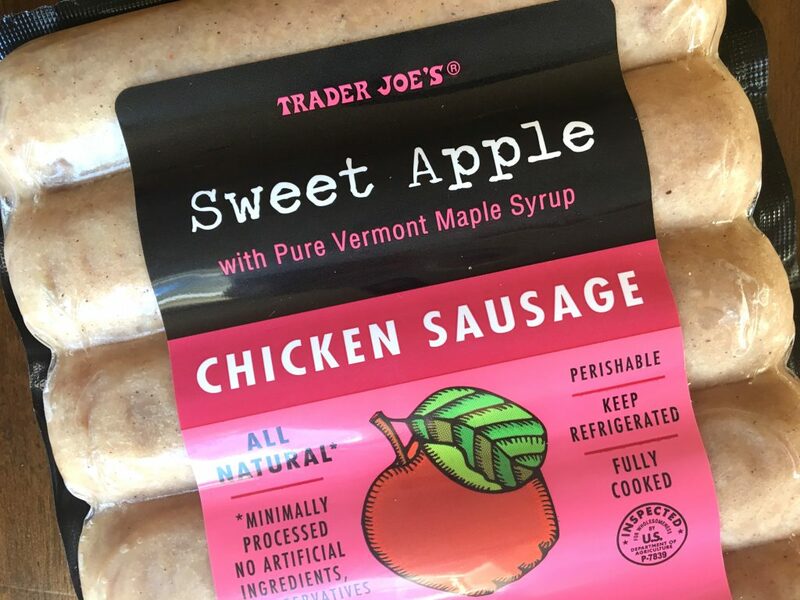 I compromise by buying this Sweet Apple Chicken Sausage from Trader Joe’s. They come in packages of five and are minimally processed. In addition, the ingredient list is short AND I know what all of the ingredients are! 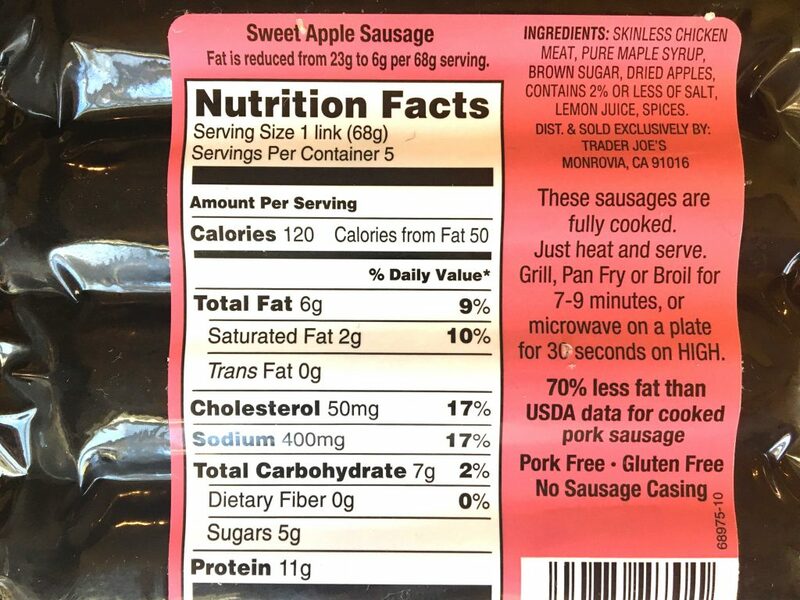 These sausages also have no pork casing. So if you are like me and don’t eat pork, they are a good alternative to regular sausage. I have seen these in several other flavors: Sweet Italian Style, Sun-Dried Tomato, and Spicy Jalapeño. Occasionally I have trouble finding a particular flavor, but typically by the next time I shop at Trader Joe’s the sausages are back in stock. Must mean they are a popular item! If it is warm and sunny outside we grill the sausages on the barbeque, but watch them carefully as they tend to crisp quickly. Not a problem if you like a little char, but if not, keep a close eye on them! Otherwise I cook them over medium heat in a frying pan with a little olive oil or cooking spray to prevent sticking, for seven to nine minutes, rotating every minute or two. Serve with or without buns and add your favorite condiments. 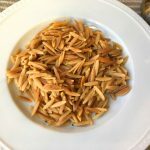 One of my favorite simple side dishes to serve with this easy weeknight dinner is whole wheat orzo. It cooks in just about 20 minutes, start to finish. Again, the ingredients are minimal, so I feel good about feeding it to my family! The recipe is for a very basic version (quick and easy! ), but there a few options you can add towards the end of cooking for a little more flavor. Toasted slivered almonds are a good addition as it gives the orzo a little more crunch. I buy raw slivered almonds at Trader Joe’s. Toast the slivered almonds at 350 degrees for 5-7 minutes, watching them closely so they don’t burn. All ovens are different though, so you will have to adjust the toasting time for yours. My husband actually doesn’t like nuts in foods, so I’ll put a serving of the orzo on his plate before adding the toasted slivered almonds to the orzo for the rest of the family. 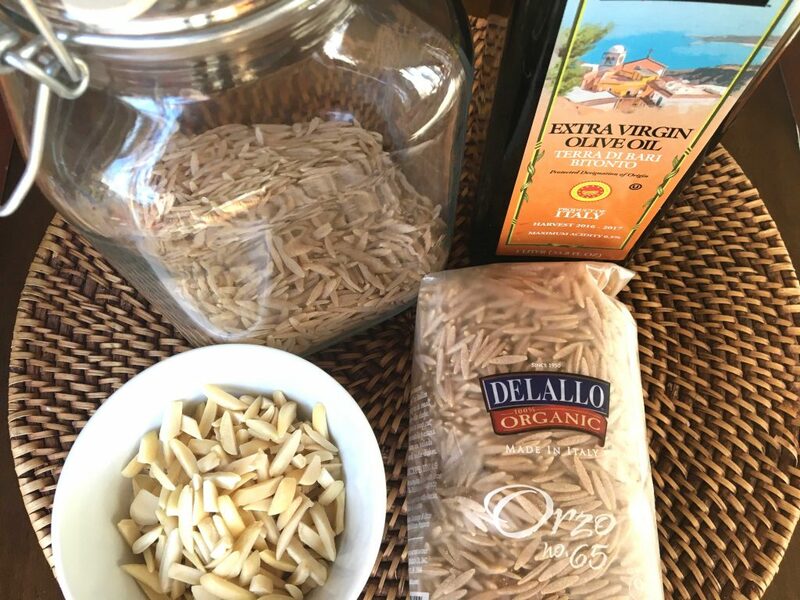 Another yummy addition is adding Parmesan cheese to the whole wheat orzo instead of eating it plain or with the almonds. My kiddos love cheese, so of course adding it to meals is a bonus for them! Finally, mix together your favorite simple salad and your easy weeknight dinner is ready to go! Meal planning was a little tricky this week with everything going on, but I managed to come up with 4-5 quick and healthy options to satisfy everyone’s bellies. I’m so glad I sat down last Friday to meal plan. If you would like to see how that process works for me (and how it can also work for you too!) see Meal Planning 101: Ultimate Tips For Busy Moms on how and why I meal plan weekly. There is also a link in the post for a free printable meal plan to help get you started! Hopefully you can use this quick and easy weeknight dinner the next time your family is having a busy week! Heat the olive oil over medium heat for 1-2 minutes. Add orzo and stir until all pieces are coated with the olive oil. Cook for about 5 minutes to toast, stirring occasionally so the orzo does not burn. Add in the chicken broth, stir, and bring to a boil. Reduce heat to a simmer and cover for 10-12 minutes until the broth is absorbed. Check the orzo during the last few minutes of cooking to make sure it is not sticking to the bottom of the pan. Add small amounts of additional broth if necessary. *If using Parmesan cheese or toasted slivered almonds, stir them in during the last minute or two of cooking.